OK, so we know summer hasn’t quite come to an end yet, but it won’t be long before we’ll be braving the elements, digging out our knitwear and dusting off our winter gloves! Autumn is all about finding key staple items that can be layered when the weather gets cooler. 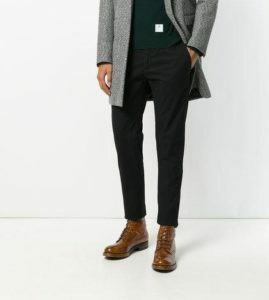 Autumn clothing needs to be comfortable without losing the seasons signature tailoring and most stylish seasonal colours. Our CEO and founder, Everton Chambers has picked his 5 must-have staple pieces that every dapper gent must adorn his wardrobe with. Update your wardrobe with a go-to tweed or textured blazer. Perfect for slinging on over chinos or smartening up a dark denim ensemble. 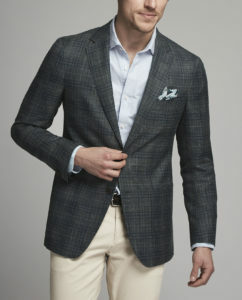 Team your blazer with tanned accessories to achieve a less formal daytime look. 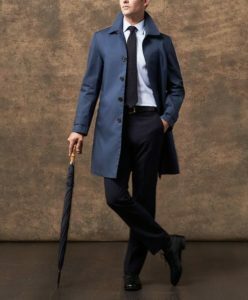 A timeless tailored piece that every gent should own, a mac or trench coat is ideal for a tricky transition between summer and autumn. This practical yet stylish garment will suit countless outfits and many occasions. Why not opt for a navy, grey or black design to ensure it fits into your winter wardrobe with ease. 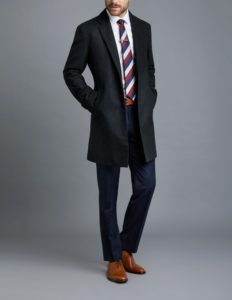 Forever on-trend, a smart, tailored overcoat is a timeless piece that can be thrown over a suit or worn casually over jeans. A single-breasted design with a single back vent will be universally-flattering and will be your ‘go-to’ item for the chillier seasons. For years the classic white shirt is a staple and the most versatile garment a man can own. Inject colour into your wardrobe by teaming this multipurpose piece with a vibrant tie or ink blue suit. Layer your look this season with a simple jumper and chinos or team with a blazer and dark denim for a smart casual look. 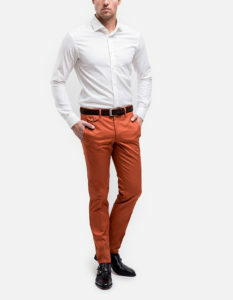 Chinos are as versatile as they are fashionable and are a must-have for every man. Cuff your chinos to complement brogues or boots and team with a lightweight knit or a casual shirt for the cooler months. Earthy browns and shades of mid to navy blue are a popular wardrobe choice for autumn. If you’re feeling brave, why not opt for a blackcurrant or deep raspberry red chino?! Follow us on Instagram @chambersbespokeltd for the latest news, collections and style advice!